General Motors is recalling nearly 106,000 sport utility vehicles in the United States and Canada to fix a rear door latch that may not close properly due to corrosion. The vehicles affected by the potential safety defect include the Chevrolet TrailBlazer EXT and GMC Envoy XL SUVs from the 2002-2003 model years. There is one report of an injury because of the the faulty door latch. A small number of 2003 model Isuzu Ascender SUVs are also affected. GM builds the Ascender for Isuzu Motors Ltd. Roughly 98,000 of the recalled vehicles were registered or sold in Northeast and Midwest U.S. states, where corrosion can occur due to winter road salt. Stihl is recalling about 6,300 of its BR 500 and BR 550 Backpack Blowers. The fan wheel on these backpack blowers could break, resulting in pieces of plastic flying out of the blower housing. This poses a risk of injury to the user or a bystander. Stihl has received five reports of the fan wheel breaking. No injuries have been reported. These backpack blowers have serial numbers ranging from 264264925 through 264740832 which are located on top of the engines cylinder on the fin. The spark plug boot can be removed to view the serial number from the exterior of the blower. The units were sold at authorized Stihl dealers nationwide from January 2005 through May 2005 for about $450. Consumers should stop using these blowers immediately and return them to an authorized Stihl dealer for a free repair. Consumer Contact: Contact Stihl at (800) 610-6677 between 7 a.m. and 8 p.m. ET Monday through Friday or visit Stihls Web site at www.stihlusa.com. International Comfort Products LLC is recaling about 28,000 gas furnace and AC units. The unit's control board can ignite and, in certain units, can result in the ignition of flammable material adjacent to the unit. The firm has received three reports of minor property damage. There are no reports of injuries. The recall involves certain packaged gas furnace and air conditioning units sold under the brand names Airquest, Arcoaire, Comfortmaker, Heil, Keeprite, Kenmore, ICP Commercial, and Tempstar. The recall includes configurations of A chassis units with 3-ton or 5-ton cooling capacity, manufactured between the 41st week of 2000 and the 26th week of 2003. The model and serial numbers are printed on the units rating plate. The rating plate is on the exterior of the unit, on the right side (as viewed when facing an installed unit). Contact the firm to check if your model and serial number of your unit is included in the recall. The units were sold by heating, ventilation, and air conditioning dealers and contractors nationwide between October 2000 and September 2005. Consumers with recalled units will receive a free replacement control board and capacitor installed. Consumer Contact: For more information, contact ICP at (800) 649-4706 anytime, or visit the ICP Web site at www.icpusa.com. Bombardier Recreational Products Inc. is recalling its Bombardier Outlander 800 H.O. XT ATVs. The drive pulley inner flange could break resulting in the broken flange fragments becoming a projectile. This situation could cause serious injuries or death to the rider or bystanders. There have been no reported incidents of injury or property damage. The recalled vehicles are model year 2006 Outlander 800 H.O. XT Bombardier ATVs. The model numbers affected are 2J6A and 2J6E. The model numbers are located in the serial number on the identification sticker under the seat. The ATVs have the words, Bombardier and Rotax 800 on the fenders. The ATVs were sold at Bombardier dealerships nationwide from July 2005 through October 2005 for about $9,399. Consumers should stop using these vehicles immediately. Registered owners have been notified about this recall by mail. Consumers with a recalled Outlander 800 H.O. XT should contact their local Bombardier ATV dealer to schedule the free repair. If consumers are unsure if their ATV is affected, they should call Bombardier. Consumer Contact: Call Bombardier at (800) 366-6992 between 8 a.m. and 5 p.m. ET Monday through Friday, or go to the firms Web site at www.brp.com. A.O. 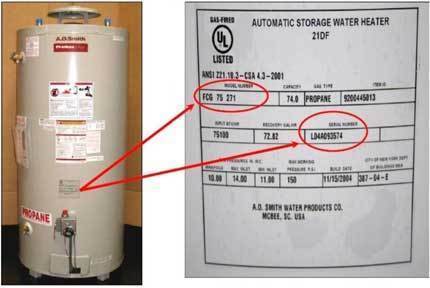 Smith is recalling about 5,000 75-gallon propane gas water heaters. The water heaters can accumulate soot on the burners, posing a fire hazard. The recall involves 75-gallon propane gas water heaters. The heaters have the name A.O. Smith, Reliance, Apollo, State, or Maytag on the side of the unit. The model number is located on the rating plate. Only units with the model numbers listed below and manufactured between January 2004 and July 2005 are included in the recall. The units were installed by independent contractors and plumbers nationwide from January 2004 through July 2005 for between $460 and $1,130. Consumers should contact A. O. Smith to arrange for free repair. An outbreak of E. coli disease in Minnesota has triggered a nationwide consumer alert about certain packages of Dole salad mix. The U.S. Food and Drug Administration issued a warning to consumers to avoid eating three brands of Dole salad that were linked to 11 cases of E. coli infection in Minnesota. The alert applies to Dole's Classic Romaine, American Blend and Greener Selection packaged salads, stamped "best if used by 09/23/05" and bearing production codes starting with B250. "Given the severity of this illness, FDA believes an urgent warning to consumers is needed," said Dr. Robert Brackett, director of the FDA's Center for Food Safety and Applied Nutrition. The Minnesota Department of Health said 11 people aged 3 to 68 had become ill in mid-September with E. coli infections, which can cause stomach cramps and diarrhea. Two patients were hospitalized, but all recovered, according to the health department. Investigators found that nine of the patients had eaten Dole prepackaged salad sold at Rainbow Foods in the Twin Cities.